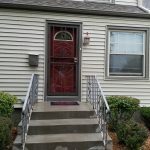 Below are before and after pictures from one of our recent security storm door installations in Chicagoland. Get a free estimate for your home here. Great news, the tax credit for windows and doors, that meet Energy Star requirements, has been extended to cover purchases made in 2015 through December 31, 2016. The tax credit includes 10% credit up to $200 for Energy Star qualified windows, and $500 for Energy Star qualified exterior doors. The credit has a lifetime limit of $500 per taxpayer. Individuals who purchased window and door products and wish to take advantage of the credit will need to maintain a record of the contract (Proof of Purchase), and a Manufacturers Certificate that confirms the product meets the Energy Star criteria to qualify for the Section 25C Tax Credit. Where to find the Manufacturers Certificate: Most manufacturers will have a copy of their Manufacturers Certificate on their websites. The company that does the work for you should be able to provide a copy for your records. (Here at Evergreen Door and Window we maintain copies from our suppliers for our customers). How to claim the tax credit: You can claim the tax credit on IRS form 5695 Residential Energy Credits. 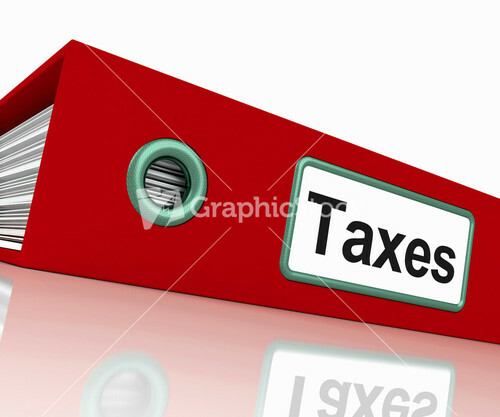 Consult your tax professional for details of the applicability of the tax credit. So take advantage of this tax credit to save on energy efficient windows and doors. We here at Evergreen Door and Window stand ready to serve. Call us at (708) 423-1720 to schedule to meet with one of our trained consultants to see what we can do for you. 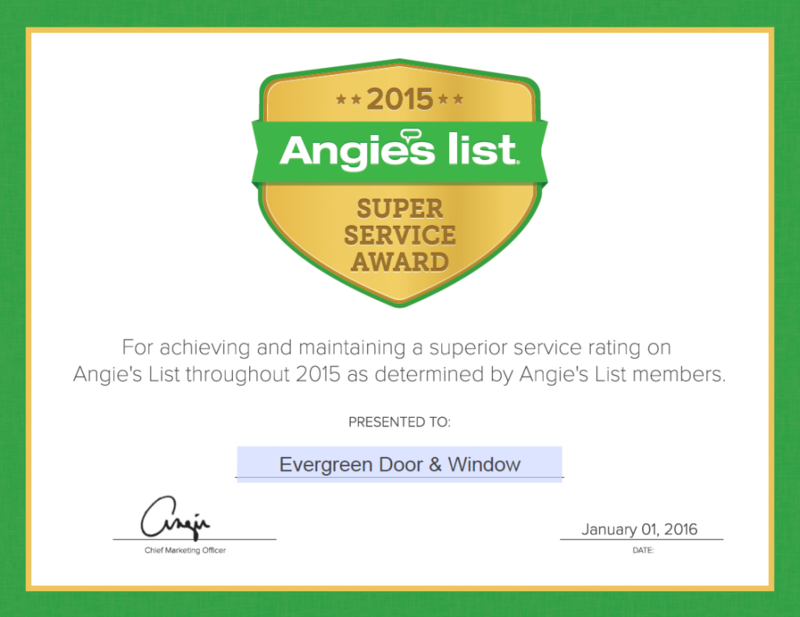 The Angie’s List Super Service Award honors excellence among service providers who maintain superior service ratings and reviews on Angie’s List. The Super Service Award is given to the top A-rated companies in their category, within their market. Eligibility is based on the size of the city and how long Angie’s List has been in that community. This prestigious award is earned by less than 5% of businesses each year, and is highly considered by Angie’s List Members when making their hiring decisions. We are very proud to have won this award again in 2015. What Benefits can you expect from your new windows? We all hear the ad’s promoting the benefits of buying new replacement windows such as “maintenance free” and “save on energy bills”, but is that all you can expect from your investment? As a replacement window customer I am here to tell you there is more to look forward to from replacing your windows. Improved Appearance and Value, Convenience, Privacy, Sun Control, Sound Control, Ventilation, reduced Maintenance, and of course improved Insulation, are just a few. 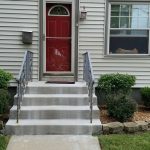 Who doesn’t want to improve the look and beauty of their home? It is amazing the impact new windows have on the look of a home. No more faded color or peeling paint showing up around the old windows. The clean look of new windows, with aluminum capping around the exterior wood for that finishing touch, revitalizes the look of the home. Window replacement is also an opportunity to bring a change of color and style to the home. For example, upgrading that front window to a bay or bow window can make an amazing impact on the look both inside and outside of your home. Replacing windows in your home adds real value to your property. Statisticians in the home improvement and real estate industry have provided some amazing numbers on the return on investment from replacing the windows and doors in your home. And for those of you that are looking to sell your home, new windows and doors are top selling points to home buyers. New windows are easier to operate than the old windows, adding convenience to the list of benefits. As mentioned earlier, new replacement windows eliminate the need for storm windows, so wrestling with that extra set of windows just to let some air in the home is over. Even glass repair is covered by many warranties and eliminates chasing down a glass company to make a repair if a glass gets broken. Most glass repairs for new windows are just a matter of getting a replacement sash from the manufacturer and can be changed by the home owner (picture windows and fixed casements excluded). Also, most new casement windows come with multi-locking fold down hardware, which lock the entire window unit from one handle, and won’t get in the way of window treatments. To many people, Privacy is very important and with raise and lower blinds and shades showing up in most window lines, you can control this element of your home right from your new windows. No more hunting down blinds or shades at the home center or hiring a blind and shade company to make and install new window treatments. Tinted glass is also available to provide a lower level of privacy control if blinds and shades are not what you are looking for. Sun Control can make a big difference in the comfort of your home. The east side of our home gets hit hard by the morning sun. So much so that it would wake our teenage daughter much earlier than she would have liked (on school days this was a blessing). After much complaining we agreed to install interior blinds to help. It reduced the sunlight but didn’t do much for the heat. This all changed when we replaced our windows with a special high performance glass. It really did the job of reducing the heat and reducing our air conditioning bill during those hot summer days. You can certainly take this a step further by adding Blinds and shades, offered in many window lines, giving you full control over how much light comes into the room. Most people don’t think of the benefit of sound control when purchasing new windows, but are pleasantly surprised at how much quieter their homes are after having new insulated windows installed. Certainly, reducing the noise level in a home adds to an improved quality of life, providing a more peaceful environment to live. Easy ventilation can make a big difference in home comfort. For those who struggle with windows that are painted shut or broken hardware has caused the window to be stuck closed, imagine how much you will enjoy the simple pleasure of being able to open your windows whenever you want. I can’t imagine living with windows that don’t open. Reducing maintenance around my home is really important to me. With little time to keep up with what it takes to maintain home, new windows are a welcome addition. Just the cleaning aspect of new windows alone is worth the price of admission. No more struggling to clean the storm windows and then trying to figure out how to clean the outside of the primary windows without dangling from a ladder or climbing out on the roof with the Windex. Then, there is the fun of trying to get all the streaks off either the storm window or the interior window. New windows eliminate the need for storm windows so cleaning one window versus two per opening cuts cleaning time down significantly. The tilt in feature of most products eliminates the death defying feat of cleaning windows from a ladder. All the cleaning is done from the inside of your home. If cleaning windows is really not your thing, you can take advantage of some of the new “self cleaning” glass, available from most quality window brands, which can really reduce how often cleaning is necessary. Another chore you won’t miss is scrapping, painting, and staining the interior and exterior of those old windows. Yes, vinyl replacement windows are truly maintenance free. The benefit of improved insulation value is certainly not to be ignored. Not to get technical but, it has been calculated that an average size windows with an 1/8” gap between the window sash and frame leaks as much as a brick size hole in the wall of your home. Buying the right new windows can increase the efficiency of the window openings in your home by 400%. Having experienced this myself the results are amazing. This high performance glass will also reduce fading of floors and furniture from the sun. In short, you can look forward to a more comfortable home and savings on your energy bills. Hopefully, this sheds some light on some of the benefits you didn’t know you can expect from investing in new windows for your home. So what are you waiting for? Prices will never be lower than they are now. Evergreen Door & Window can provide the solution so you can start enjoying all the benefits of new windows. Most companies cannot survive without a well thought out marketing plan. Hopefully, most of us know by now advertising is aimed at getting you, the customer, to ultimately make a purchase. But some of the ad’s now a days seem a little farfetched for me, and quite frankly an insult to our intelligence. This article is aimed at reviewing realities of the “FREE” promotions, and claims, with the hope of stirring some thought before responding to an offer that seems too good to be true. And if it sounds to good to be true, it usually is. To be fair, there are some real promotions out there that are good buys but they normally don’t come from an ad that makes outlandish claims to save you thousands. Buy 2 windows and save $400, buy 6 windows and save $2000. Save up to$150 per window and $300 on sliding Patio Door. $100 off per window and $200 off per entry door. Buy one window and get the second window for $1. $150 per window and $300 on sliding Patio Door. As low as $99 down and $99 per month. There are some basics we need to work from here. Number one, it costs money to be in business, provide quality products and services, maintain the required insurances, bonds and licenses, and pay quality installers to perform the work on your home, and of course advertising costs (to name a few). Number two, you can’t get around item number one. So, Is It Really Free? Can it really be FREE? Logically, there is an obvious problem, if you’re buying one window and getting the second window FREE, who is paying for the second window? Is the manufacturer giving away FREE windows? Wholesale window fabricators operate in a highly competitive environment and have to keep a tight rein on their cost to stay in business, so this theory is not likely. Is the remodeling company making the offer just buying windows and giving them away for free? If so, be careful, the company is ultimately going to be operating in the red and on its way out of business, which means no warranty or service for you. The thought that the remodeling company you are working with is really giving away free windows is contradictory to one of the reasons to be in business in the first place, to make a profit. For this reason, this theory is unlikely. So the only logical conclusion has to be the cost of that FREE window has to somehow be incorporated in the final price of the job. Not to suggest anything under handed mind you, but this could be accomplished by increasing the price of the other windows on the job to cover the cost of the FREE window. It could also be done with some cleverly place surcharge mixed in to the proposal. Unfortunately, however the cost of the free window is recovered, that means only one thing, It isn’t FREE. Some special consideration should be given to the “FREE INSTALLATION”. Free installation is an interesting idea but does that mean they are not paying their installers for putting in your windows? I don’t think I would want an unpaid crew working on my home. Then there is financing. Financing is a popular way to pay for expensive remodeling to your home. Not many of us can reach into our check books and write a $10,000 or $20,000 check for a remodeling project. So it makes sense to take advantage of no interest financing, but whether you want to know it or not, there is a cost to no interest financing. But here are some offers (listed above) that seem a little low for a reasonable payoff period for window replacement project. At $99 down and $99 per month that will cover $1287 the first year and $1188 per year after that. How many years do you want to pay for this remodel? The second offer has me a bit baffled. At $8 per month with 60 months financing that covers $480 of the cost of the remodel. How much is this project? The math just doesn’t seem to work out. The best advice I can give you is, if it doesn’t add up BUYER BEWARE. In Summary, outrageous advertising has been around for a long time and looks like it will continue to be. My hope is that I stirred some thought, causing you to use common sense when evaluating whether the offer you are considering is real of just displayed to get you to make that call. The age old rules apply when choosing a company to work on your home. Find a reputable dealer who has a lot to lose by not treating you right, with a strong reputation, has some longevity in the business, can provide evidence of insurance and referrals, and you will find, for the most part, you will be treated fairly, and ultimately get the job you want for your home. The old saying holds true: “The bitterness of poor quality lasts long after the sweetness of a low price”. Evergreen Door and Windows takes pride in treating our customers to the best products, with the best installation, at fair reasonable prices. In business for over 50 years, we will be here when you need us. Call us for your Really FREE estimate today at (708) 423-1720. Over the last 20 years there have been many new products and materials introduced in the market but one remains a proven, and consistently, the most cost effective choice for your remodeling project, Vinyl Replacement Windows. From color choices, warranties, maintenance, performance, and cost, Vinyl Replacement windows add up to one of the best overall values available for replacing your windows. Since there is such a wide range in quality and features in the market place, the products used to support the information presented here are Simonton, Sunrise, and Great Lakes Windows. These brands have a proven track record for consistently providing a high level of quality while remaining on the cutting edge of the latest technology. Vinyl is actually one of the most ideal materials for a building product. It is non-conductive, impervious to the elements, the same material used in many of the plumbing pipes in your home. The material can be extruded into a desired shape and thickness, for optimal frame, sash, and sill members. 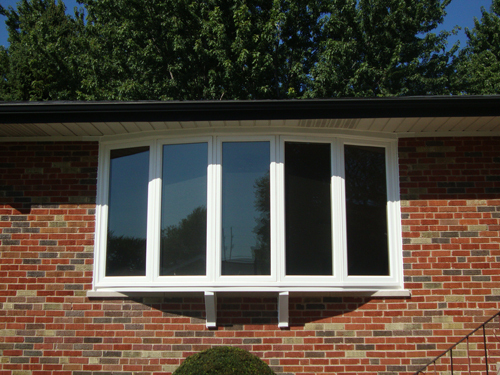 Vinyl windows are custom made as a standard, in many cases made to sizes on the eighth of an inch. This means a truly custom fit to your home. One of the strongest features of vinyl windows is they are maintenance free. The vinyl material is not affected by the typical moisture, cold, or heat found in a home. There is no painting or staining required to maintain the product like you would find with wood windows. Vinyl Windows are also protected by the strongest warranties in the industry. Lifetime transferable warranties against rotting, peeling, discoloring, material failure, seal failure, and in some cases glass breakage. In comparison Anderson, Marvin, and Pella windows come with a 20 year warranty against seal failure, and 10years coverage against material failure, with no transferable warranty option. There is certainly a strong advantage here for those that go to sell their homes, and can supply a warranty on the windows in the home to potential buyers. These three suppliers have kept pace with Performance requirements set by Energy Star and now offer products with U-Values lower than .20 (significantly lower than the Energy requirement of .30 U-Value). Many wood products on the market would find it difficult to match this performance. The affects of these highly efficient products will provide the homeowner with a major step towards improving the energy efficiency of their home, and reducing energy bills. Over the last 5 years these suppliers have also increased the color options that were not previously available. You can now enhance your home with five interior wood grain options, along with a library of exterior color options (thanks to the latest in exterior paint technology). • Have a proven track record with years of market performance. • Now available in greatly expanded color options. This presents a strong case for consideration when looking into replacing your windows. Evergreen Door and Windows showroom has these products on display for your inspection, or call for a free no obligation in home estimate and we will bring the products to you. ENERGY STAR is a U.S. Environmental Protection Agency (EPA) voluntary program that helps businesses and individuals save money and protect our climate through superior energy efficiency. Many municipalities set their requirements for permitting new construction and replacement projects by the Energy Star Standards (In this article the focus will be on replacement windows). The program has provided tangible results since its inception and is preparing to raise the standards for windows, among other items, in 2016. What effect will this have on the supply chain and to the end users? This article is an attempt to inform on the change to come and some of its ramifications on suppliers and consumers, and might not cover all possible scenarios. Who is Energy Star? The ENERGY STAR program was established by EPA in 1992, under the authority of the Clean Air Act Section 103(g). Section103(g) of the Clean Air Act directs the Administrator to “conduct a basic engineering research and technology program to develop, evaluate, and demonstrate non–regulatory strategies and technologies for reducing air pollution.” In 2005, Congress enacted the Energy Policy Act. Section 131 of the Act amends Section 324 (42 USC 6294) of the Energy Policy and Conservation Act, and “established at the Department of Energy and the Environmental Protection Agency a voluntary program to identify and promote energy–efficient products and buildings in order to reduce energy consumption, improve energy security, and reduce pollution through voluntary labeling of or other forms of communication about products and buildings that meet the highest energy efficiency standards.” Now in its 23rd year, the ENERGY STAR program has boosted the adoption of energy efficient products, practices, and services through valuable partnerships, objective measurement tools, and consumer education. ENERGY STAR benefits have grown steadily over time, nearly tripling in the last decade. As of December 2013, families and businesses have realized estimated savings of more than $295 billion on utility bills and prevented more than 2.1 billion metric tons of greenhouse gas emissions over the past two decades. The most recent changes in the Energy star requirements set the U-Value for windows for our region of the country at .30. That means, if you live in a suburb of Chicago that requires a permit to replace your windows, evidence needs to be supplied to your local building department, when applying for a permit, proving the new windows for the project meet the Energy Star .30 U-Value requirement. There will also be a site inspection by the building department inspector while the work is being done. The inspector will need to see the new windows displaying the proper label listing the U-Value. Without meeting these conditions your window replacement will not be approved by your town or village. Energy Star is planning a change to their standards for replacement windows in 2016. This change is: Energy Efficiency Requirements for Windows Climate Zone U-Factor1 SHGC2 Northern* ≤ 0.27. The effective date for the Northern Zone prescriptive criteria for windows is January 1, 2016 (taken from Energy Star website). What does this mean for the suppliers of windows and consumers looking to change their windows? For suppliers, this new standard will present some challenges. Manufacturers will need to make an additional investment in the latest glass technology, which is an increase in the cost of providing products. Some manufacturers will actually have to revise the design of their products and re-tool their manufacturing process to accommodate this change. This can prove to be very costly to some manufacturers, who have not been preparing for the potential for these changes. Energy Star estimates the potential increase in cost to be minimal. This remains to be seen. That cost will need to be passed on to the end user, consumers, which mean the cost of replacement windows will be higher. On the flip side, a more efficient product should mean a reduction in utility bills, which provides a payback for the additional investment to the consumer. It ultimately leads to a cleaner, healthier environment and less of a strain on our energy resources. Consumers will need to be knowledgeable of this energy efficiency requirement when purchasing new windows for their homes or risk being stuck with windows that cannot be installed without repercussions from their local government, such as fines or even litigation. Customers replacing their windows will also need to be careful to choose a contractor that is up to date on requirements for their area. In summary, The Energy Star 2016 requirement of .27 U-Values will have positive and negative implications in our market. Placing challenges before manufacturers to adapt to this change and be prepared for future developments in energy efficiency. Customers can expect to pay more for these new energy efficient windows but should receive a payback along the way with potentially lower energy bills. For Energy Star, this is another step forward in the fight against reduction of our energy resources, and increased comfort for homes replacing their windows. Your remodeling project, whether it is windows, siding, roofing, entry doors, or patio doors (to name a few), is essentially made up of 50% product and 50% installation. There is a library of information available on products. Online resources are extensive, such as manufacturers websites, rating companies such as Consumer Reports, and showrooms where you can see and feel the products available, and more. So what about the other 50% of your project, the installation? A great product is only as great if it is professionally installed. The greatest challenge that remodeling company owners face is having the right installation talent to perform the work. The shortage of skilled installers is a grave concern in the remodeling industry. For years now the number of high school graduates enrolling in the trades has been dropping, reducing the available talent pool for remodeling companies. As a customer with a need for remodeling on your home, how do you evaluate this element of your project? To be clear, this subject can lead to rather lengthy answers. The hope here is to give basic insight as to some things to look into, when evaluating the company you’re about to hire, to be confident they have the right talent to provide the results you are looking for. Developing a skilled installation crew takes time. That puts the advantage to companies that have longevity. They have had years to hire, train, and mentor good talent into great talent, training teams to provide a complete professional experience. From arriving on time, setting up, preparing the site and communicating with the customer the approach that will be taken to complete the project, there is no substitute for experience. The disadvantage goes to start up companies and companies that rely on subcontractors to keep their costs down. Startup companies have to endure the great risk of relying on interviews, and referrals, in the hopes of landing the right talent to perform the work. Companies relying on subcontractors run the risk of losing talent if they find a better offer somewhere else. This leads to turnover in the production department which can cause lack of consistency in the quality of work. Remodelers can also lose good installers over issues such as pay, poor job planning and communication, leading to a frustrating work environment and project delays. It takes a smart owner to identify, develop, and keep the people that will make them successful, a balancing act for sure. Providing the supporting staff, making sure the job has been ordered correctly, and the right materials are available, so the installers can focus on one thing, doing your job right. So the advantage goes to the companies that have survived the task of training, and developing great crews, who can be counted on to provide the best quality work, consistently, while mentoring new installers as the company grows. So how do you, the customer, evaluate the other 50% of your purchasing decision, the installation? Here are a few things to look for. Look for the remodeler who not only presents superior products but also presents the installation and the people who will be involved in making your project a success, during the estimating process. This speaks volumes on who you are dealing with. Request a list of similar projects in your area, and go and inspect the workmanship. “The proof is in the pudding” as they say. Talk is cheap, inspect samples of their work. Ask your friends and neighbors for referrals and do your home work. Check out ratings with key rating agencies such as The Better Business Bureau. If a company has been in business over 20 years and maintains an A+ rating with the Better Business Bureau, there is a high probability they have the installation you are looking for. That typically means they keep their customer happy. Evergreen Door and Windows makes this choice easy. Over 50 years in business, maintaining and A+ rating with the Better Business Bureau, with over 10,000 successful jobs completed. This success is directly related to our greatest asset, our installers. Our entire installation team has been with us over 10 years and some veterans over 20. As our logo states, “Custom fit expert installation” is what we bring to your remodeling project. 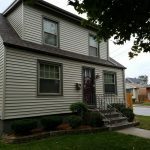 Visit our website today at www.evergreenwindow.com, or call (708) 423-1720 for a free professional estimate, and learn more about how our team can work for you. With the Arctic cold, snow, and winds our area has been enduring in recent weeks, we have received a number of calls about failed or malfunctioning garage doors and garage door openers. So, before you decide to call us to come out and service your garage door, which is going to cost you at minimum our basic service fee, let’s run through some general troubleshooting that will help resolve the problem while saving you money. Before attempting to open your garage door, either manually or with a garage door opener, make sure to clear away all ice and snow along the bottom edge of the door. Otherwise, the weather-stripping can become frozen in place and be damaged when you try to raise the door. Lubricate the tracks, wheels, hinges, and other pinch points, preferably with silicone spray, but 3-in-1 oil will also work. This general maintenance should be performed a couple of times a year to keep all parts moving smoothly, especially in the case of double wide (2-car) doors, which are heavier and have more pinch points that can bind up if they are not properly lubricated. Bear in mind that after about 5-7 years, the springs on your garage door may need to be replaced, as over time they will break. This is normal, unfortunately, regardless of manufacturer, and you will have to pay for the cost of the new springs as well as the technician to install the new springs. If your power garage door will not open or close properly (stops and reverses direction), this generally means that the sensors have become misaligned and need to be corrected. This can happen especially in the winter, when ice and snow can bump the sensors out of alignment, but it is a relatively easy fix. Simply locate the sensors near the bottom of each side of the door. If the lights are flashing or not lit, this means the sensors are not communicating properly. Simply move the sensor slightly until the light stays lit, and activate the door to see if it now operates properly. It may take a couple of adjustments and is often easier if you have someone on each side to adjust the sensors. If the opener does not respond to your remote control, first off, replace the batteries in the remote. You may then need to reprogram the remote. Check your owner’s manual for simple directions. If you don’t have a manual, you can generally locate and download one from the internet for free in most cases. If replacing the batteries does not solve the problem, most hardware and big box home improvement stores carry replacement garage door opener remotes. Again, you will have to program the remote to your particular opener. If none of these easy corrections resolve your problem, it may be necessary to replace your garage door opener completely, which is going to cost you around $400. If that’s not in the budget right now, you can always disengage the electric opener and go old school, operating the door manually. Remember, though, that this means there is no locking mechanism active on your garage door, so you will have to find a way to secure your door until you can replace the unit. Whether you need to replace your entire garage door system (after all, accidents do happen, particularly in winter), or just the opener, we can help you select the product that best meets your needs. 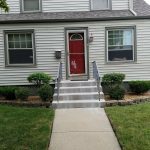 For a free, professional consultation, visit our website at www.evergreenwindow.com or call us at (708) 423-1720, and we will be happy to help! We know that our business depends on the trust of our customers, and we want to take this time to thank all of you for putting the wellbeing of your homes and families in our hands. We are proud to be a part of this community for over 50 years. Thank you again for your loyalty and faith in us.